Visit my blog for a link to a developmentally appropriate video about Dr. Martin Luther King, Jr. and while you are there check out my newest resources for nonsense word fluency. 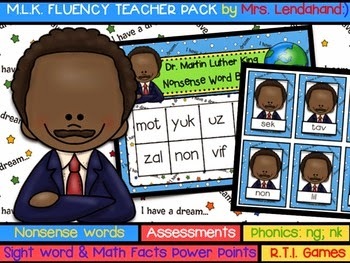 Your little kindergarten and first graders are sure to love the video and you may be tempted to take a peek at my nearly free MLK Bingo and Nonsense Word Fluency Pack over at Teachers Pay Teachers! This Fluency Teacher Pack is the start of many Fluency Packs yet to come and serves as a thank you to all my fabulous TpT teacher friends who are choosing to make Lendahand's Printables resources a part of their instructional day.